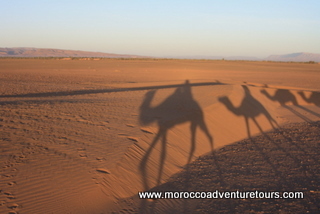 Splash Morocco are pleased to offer a two day tour to the Sahara Desert at Zagora. On the way, we leave Marrakech early, stopping for breakfast on the Tizi-n-Tichka pass which snakes its way over the Atlas Mountains. 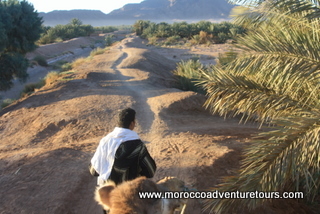 We then continue to Ouarzazate, an oasis town on the edge of the desert for a spot of lunch. After this, we continue to Zagora. This is the gateway to the Sahara Desert and this is where we mount or camels and ride for an hour across the rock and sand to our camp for the night. Feast on tagines and bread and wait for the local Saharawi men to entertain us with their drums and singing around the campfire. The stars are amazing here too! 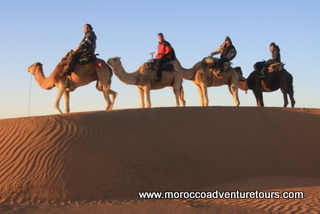 Early start to check out the sunrise as we ride the camels back to a small hotel where we freshen up and grab some breakfast. After this, it’s back in the vehicles and off to Ait Ben Haddou, a beautiful kasbah, often used as a movie location for Hollywood blockbusters like Gladiator starring Russel Crowe. We have lunch here before making the drive back over the Tizi-n-Tichka pass and back to Marrakech. We run these trips to suit your dates and needs wherever possible and are happy to be flexible. We only need 4 people to run a trip. If we can’t get 4 people together, we can arrange a tour with another company or offer your money back – it’s up to you.